More than a dozen civilians have lost their lives when the US-led coalition purportedly fighting the Daesh Takfiri terrorist group carried out a series of aerial assaults in Syria’s eastern province of Dayr al-Zawr. 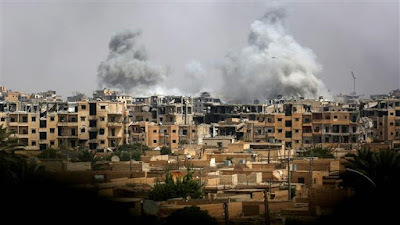 Local sources told Syria’s official news agency SANA that 16 people, including 9 women, were killed in the US-led aerial attacks against residential buildings in al-Bahra village on Tuesday afternoon. The sources noted that the death toll is expected to rise as some people had been critically wounded in the airstrikes. The London-based Airwars organization, which tracks civilian deaths in US-led airstrikes, reported earlier this year that a total of at least 5,961 civilians had been killed as a result of the attacks in Iraq and Syria. The so-called Syrian Observatory for Human Rights (SOHR) reported on November 23 last year that 2,759 civilians, including 644 minors and 470 women, had been killed in US-led aerial attacks against civilian areas in Syria over the past 38 months. The monitoring group added that the US-led air raids had claimed the lives of 98 people, including four children and as many women, between October 23 and November 23 this year. The SOHR went on to say that the civilian fatalities had been mostly recorded in the northern provinces of Hasakah, Raqqah, Aleppo and Idlib in addition to the eastern province of Dayr al-Zawr. On December 14, 2017, Syria’s Ministry of Foreign Affairs and Expatriates stated that the US-led coalition is indeed targeting civilian facilities and providing Daesh terrorists with cover. It noted that Daesh terrorists have been purged from most regions in Syria only through counter-terrorism operations conducted by government troops and allied fighters from popular defense groups. The Syrian foreign ministry also criticized the so-called advocates of human rights and rule of law for turning a blind eye to the atrocities the US-led coalition is perpetrating in Raqqah and Dayr al-Zawr provinces. Meanwhile, at least five civilians have lost their lives in separate rocket attacks by foreign-sponsored Takfiri militants against residential districts in and around Syria’s capital city of Damascus. A woman was killed on Tuesday afternoon when several rockets fired by Takfiri terrorists struck Jaramana city, located 3 kilometers southeast of Damascus. A little girl also lost their life after projectiles slammed into another district in the same Syria city. Two projectiles also slammed into the campus of Faculty of Science in the capital, though there were no immediate reports of casualties and the extent of damage caused. Militant rocket shells also fell near a school in the capital, claiming the lives of three school children.